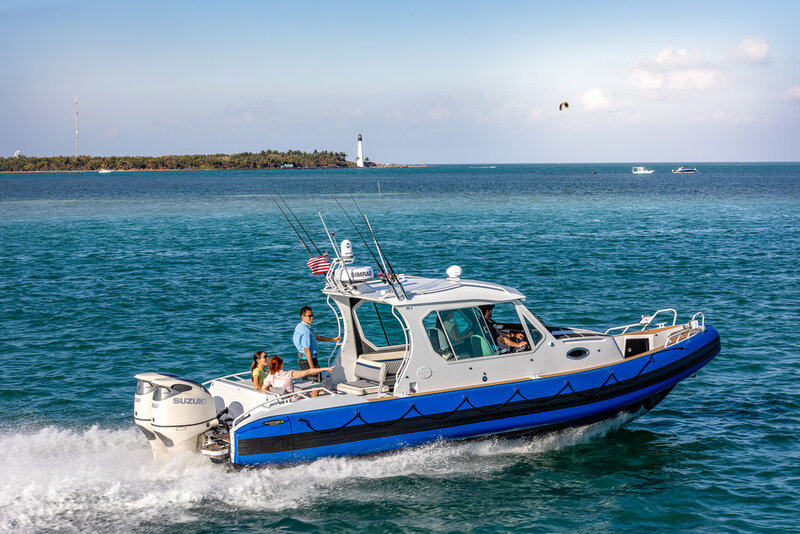 The 31FT GT COUPE highlights class leading features for all types of boaters. With its sleek styling, impressive performance, optional galley / 3rd suspension seat and enough amenities to please a long weekend adventure. There is a macerating head in the cuddy, and removal cushions which create a 45 sqft berth. This is a boat that is tailored for a wide range of boaters. It is sure to turn heads, and spark dock conversations when you see it. If you boat in cold climates you will love the optional diesel heater, and makrolon canvas enclosure. And for the warm climate boats, when you remove the canvas and open the windows the cabin will seam to disappear. Not to forget the fisherman, the boat is available with two 36" long fish boxes, downrigger pads, and welded on rod holders. Even room on the radar arch for a 7" chartplotter/ fishfinder display. The boat is also available with our signature folding bow door, and optional underdeck anchor windlass. Diamond Plate (OP) ................ .190"
Courtesy Lighting inside and Along the Gunnels.